there is a woman i know via the internet, a wonderful talented designer named chappy. now chappy has designed many patterns over the years, but none as special as the booby sock. 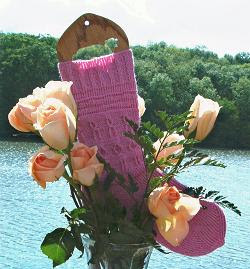 thats right you heard me the booby sock,a sock designed for woman by a woman in support of breast cancer awarness/ i would love if all of you could take a look at this pattern and order it , part of the proceeds go to the susan b cancer reasearch foundation a very worthy cause indeed. we all have to do our part in finding a cure for breast cancer. woman and men alike as it is not just a disease for woman. men too can get breast cancer. so hop aboard and order your pattern from chappy, you wont regret it, its a wonderful design from a talented designer for a cause that needs our help. we all know some one somewho has either suffered from breast cancer or who has had a family member or friend devistated from this disease. wont you please do your part and help? You've all heard of bobby socks; well, this is booby sock! Besides making you smile, or even giggle, there is a purpose for this sock. It is to give awareness to breast cancer. Along with keeping your feet warm, the booby socks will give you a gentle reminder to do your monthly self-breast exams and to get that annual mammogram! 1st pattern band represents our tireless, unending footsteps to raise money to help find a cure. 2nd pattern band represents the pink ribbon which is known internationally as a symbol to help raise awareness of breast cancer. A star toe was used since every woman is a star! And yes, the toe is anatomically correct! $7.50 - $3.50 of the purchase price will be donated to the Susan Komen Foundation for Breast Cancer Research. I will keep a running total posted of what is being donated. ALL PAGES OF THIS PATTERN ARE PRINTED ON HEAVY WHITE CARDSTOCK AND ENCLOSED IN A PROTECTIVE PLASTIC COVER.